Speaking of my daytime office neighborhood, I can only explain it as Lincoln Park traffic meets Weed Street club monstrosities (in the daytime, eek!) meets British School-moms-in-SUVs. In other words, I am within walking distance of VIPs, Pump it Up (the inflatable toy haven for kids), Hecky’s and Crobar nightclub. 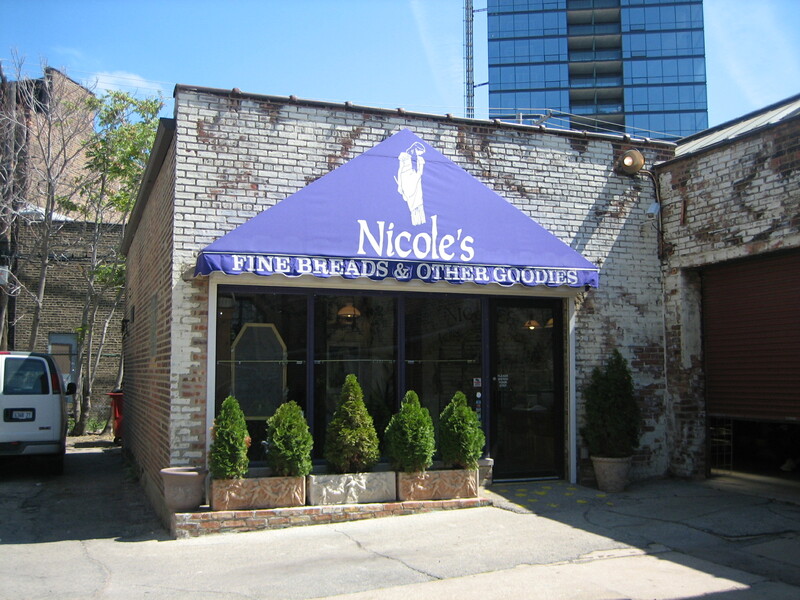 Tucked amid all of the randomness is Nicole’s Fine Breads and Other Goodies, a 25-year-old Chicago institution (I recently discovered) when I finally walked into the tiny, tucked-away storefront at 1505 N. Kingsbury today. I think I may have met the owner Nicole Bergère because a large photo of her was one of the only things on the wall. “Is this a bakery?” I asked in a duh-moment. “Isn’t that what they sign says?” she asked. Little did I know, Bergère’s been featured on the Food Network and Chicago magazine among other publications over the years, so her sarcasm was warranted! I turned the corner to see a massive bakery hidden off to the side, where flavored crackers (with names like Heaven is Lavender and Chili Chocolate Day), wafers and cookies are turned out and sold to hotels and Whole Foods. Bergère explained that they once had a cafe, but are now mostly a bakery with a small retail selection (including individual cookies I plan to make my next PM sugar fix!). To think this place has been hiding out in the hood this whole time. Like I said, duh-moment. I used to go to this place for egg salad sandwiches. They were fantastic.